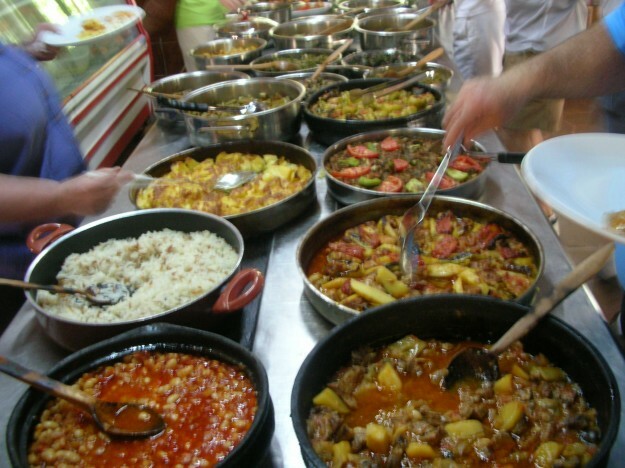 There is a concept of “lokanta” restaurants at home, where slowly cooked and ready to eat casseroles of meatballs and vegetables, vegetables cooked in olive oil, stuffed vegetables and many more are displayed on serving trays. The idea is you get a chance to eat freshly cooked “home style” dinners in a restaurant in no time; you simply pick up your tray and fill in your plate with these scrumptious food and they are very good value too. There is no waiting, and you can have a healthy, delicious meal within 30 minutes. Please check out my previous post Slow Cooked Turkish Fast Food for more delicious, affordable and healthy ways of eating out in Turkey. This week’s recipe is an all-in-one pot popular meatball and vegetable casserole (not only with the children but with the adults too! ), one of the many you can experience at lokantas, in Turkey. It is delicious, healthy and you can easily re-create at home. The casserole can either be cooked on the stove top or baked in the oven, and you can bake ahead of time. It makes a complete and hearty main course served with plain rice or with my recent bulgur pilaf with sautéed almonds. I like to add a variety of seasonal vegetables to my meatballs casserole; zucchini (courgettes) and peas work well here too. You can add as much red pepper flakes as you would like for a spicier flavor. 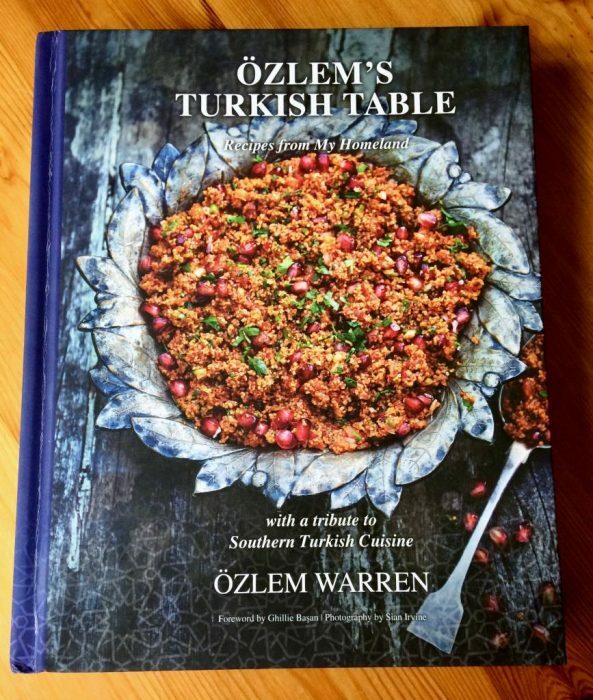 I love our hearty and healthy casseroles as well as regional specialties in Turkish cuisine and included them in my cookery book, Ozlem’s Turkish Table too – it is available to order at this link. 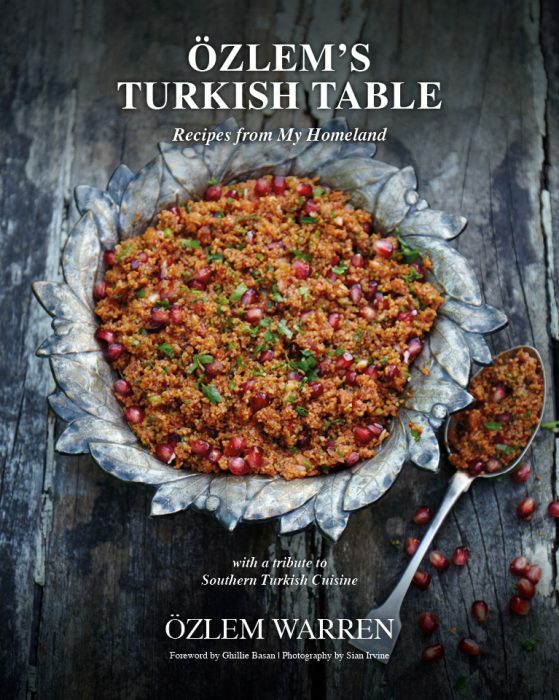 Ozlem’s Turkish Table cookery book is also on 10 % discount from March 13th to (end) March 19th, 2019, as a little gift from us for Mother’s Day, you can order a Signed copy at this link. I usually double this casserole recipe and freeze half the portion, as it freezes very well. Discard the crusts of the bread, soak in the water and squeeze dry. Then crumble them into a large bowl. 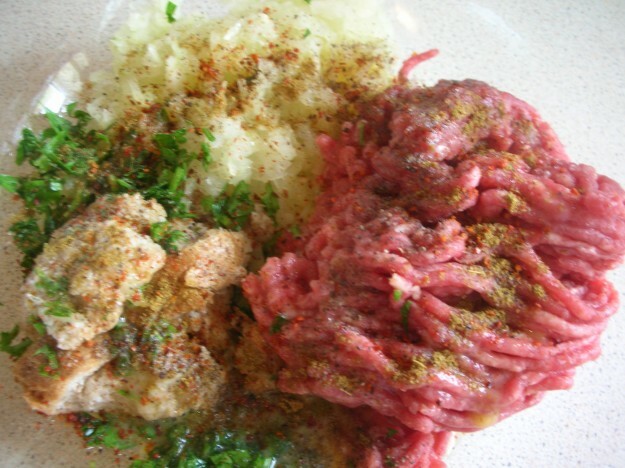 Add all the kofte, meatballs ingredients except the meat and knead well. This will soften the onions and enable the spices to blend in the mixture evenly. Add the ground meat and knead well again until the mixture resembles soft dough. With wet hands take a piece the size of a large walnut and roll into a large finger shape about 1 inch thick. Continue until all the mixture is used. The meatballs can now be covered and stored in the fridge until required. Using a vegetable peeler, peel the eggplant (aubergine) lengthways in stripes like a zebra. 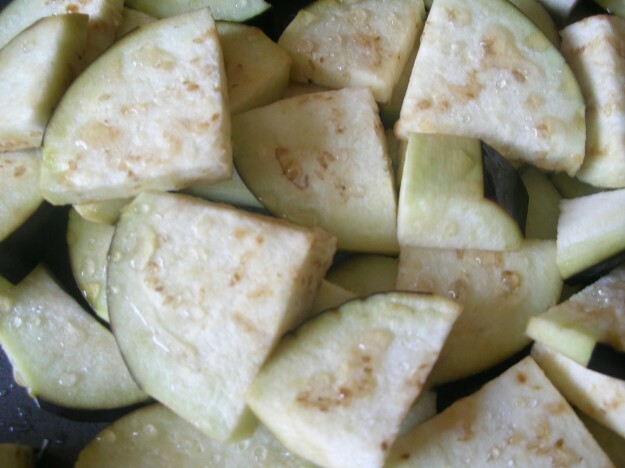 Slice the eggplant lengthways, about ½ inch thick. Then cut each slice into three parts. Sprinkle some salt over them and leave for about 15 minutes. Squeeze out their moisture with paper towel. In an oven dish, spread the vegetables. 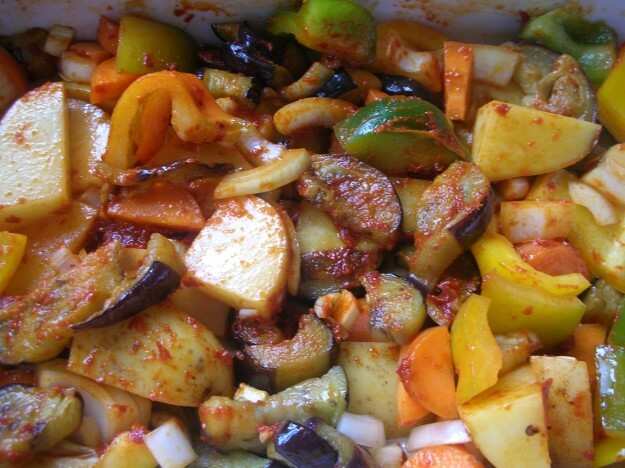 I like to coat the vegetables with the red pepper paste, olive oil, red pepper flakes, salt and pepper. Using your hands, mix the vegetables and make sure they all get this lovely coating (if you like a milder taste, you can replace the red pepper paste with concentrated tomato paste, and add more red pepper flakes for a spicy flavor). Place the meatballs between the vegetables. Add the chopped tomatoes and water, mix well. Bake in the oven for about 40 minutes or until the potatoes are soft and the sauce has thickened. Serve hot, with plain rice or bulgur pilaf with almonds by the side. Have you ever tried our traditional drink Ayran? Ayran is a mixture of plain natural yoghurt, water and a pinch of salt blended together. To make ayran, blend 2 cups of plain yoghurt with 3/4 cup water with a pinch of salt, for about 20 seconds. You will see a nice thick foam and bubbles formed at the top. Serve in water glasses with a few ice cubes in them. 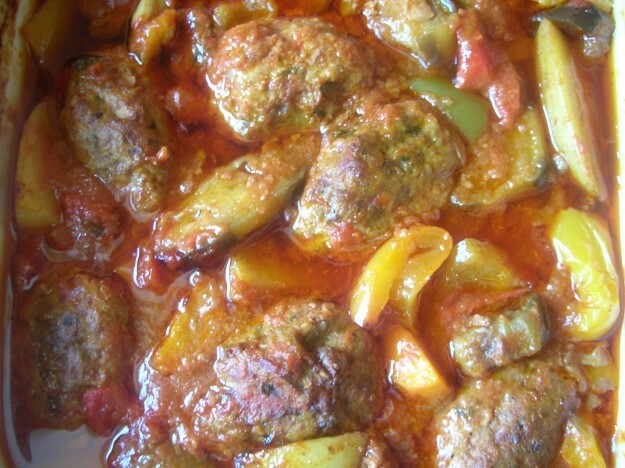 Ayran is a popular drink at home, especially with kebabs and casseroles, and it would go well with this casserole too. 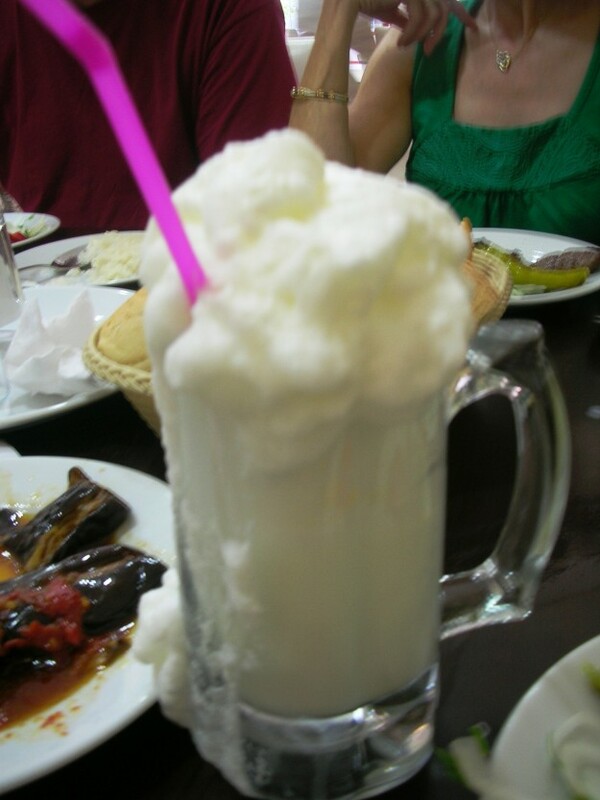 Wonderfully foamy and bubbly Ayran; our traditional drink with kebabs and casseroles. Have you ever tried Ayran? 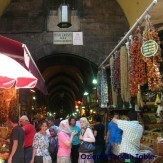 Have you had any experience at eating in lokantas in Turkey? I would love to hear from you, please share with us, thank you. Many thanks for stopping by Peter, you are right, the casserole has a great sauce and wonderful to dip your bread in:)! This looks truly wonderful! My husband has been begging for meatballs so this might just be the recipe! I am fascinated by Airan and would like to try it at home. Sounds very interesting. 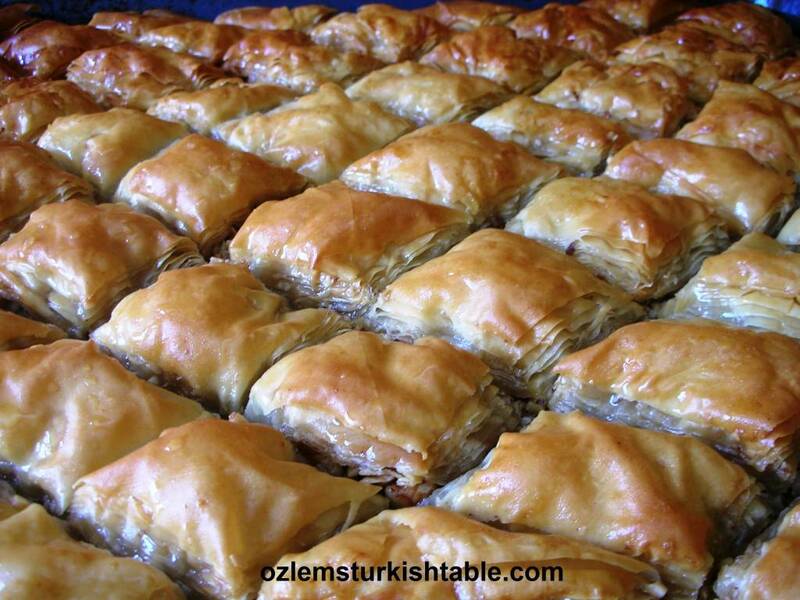 Just delicious, Ozlem! And perfect with all the summer vegetables. On a separate note: I’m sure you can make the parfaits with raspberries, but I would strain the sauce to remove the seeds before stirring in the fresh fruit. Enjoy! Thank you for the parfait update, I will strain the juices of the rasberry, look forward to trying it! Lovely dish – there’s something very satisfying about meatballs. Red pepper paste is a wonderful thing but, for some reason, I’ve never made my own. I really must. I’ve never tried Ayran either but that’s high on my list too. 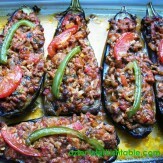 Wow Ozlem, these kofte (guess what? another shared Indian food term, we call it kofta…just love finding our cuisine commonalities!) look delicious and mouthwatering. I love eating them just as is:) All the pictures look so colorful and inviting! I so enjoy the similarities in our cuisines Peri, even the words themselves, fascinating 🙂 Very glad you enjoyed the post! Dear Ozlem…looks like my comments are not coming through now! 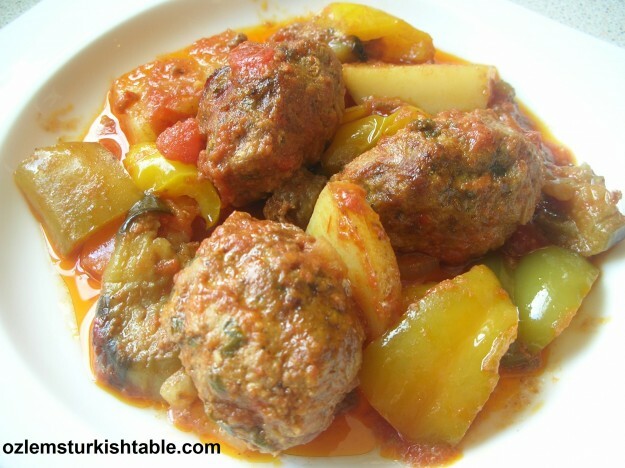 love these koftes ( we have similar koftas in India, like finding common threads:) they look so simple and delicious! 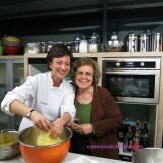 Dear Peri, apologies for my late replies, we have been away for the weekend – lovely to get your comments, as always! Thank you it seems delicious! What temperature should the oven be on? And do you have to cover it by aluminum foil?